Turkish institute of history prepares 25 volumes to refute allegations on "Armenian genocide"
Istanbul (Agenzia Fides) - The works for the construction of what will become the first newly built church in the Republic of Turkey will begin by next February. This was announced on Tuesday, January 8th, by Bulent Kerimoglu, mayor of Bakirkoy, the district of Istanbul where the new church will be built. The news was reported to journalists after a meeting between Kerimoglu himself and Yusuf Cetin, metropolitan of the Syro-Orthodox Church in Turkey. The construction works should last for a maximum of two years. 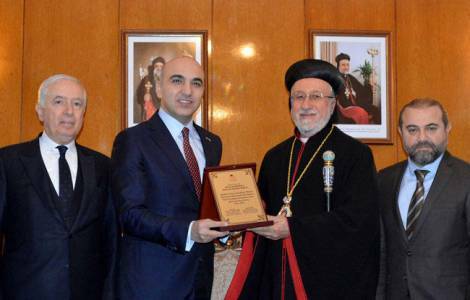 The church will be built in the Yesilkoy district of Bakirkoy, in an area not far from the Ataturk International Airport, and will accommodate more than 700 faithful. The construction of the new church was in fact already announced in 2015 by the then Prime Minister Ahmet Davutoğlu during a meeting at Dolmabahçe palace with representatives of Turkish non-Muslim religious minorities. At that time, the Syro Orthodox Christian community present in Turkey had seen a noticeable increase in the number of its faithful, with the arrival of refugees from war-torn Syria. In recent times, the signals of attention of the leadership of Turkish policy towards the Syriac Christian minority seemed to multiply, so much so that observers and commentators talked about the existence of a "Turkish plan" aimed at re-proposing Turkey as a new "homeland" for the many Syriac Christians residing in Syria and in Europe, and whose ancestors had settled in Turkish territory (see Fides 8/5/2013). In the early years of the Syrian conflict, the Turkish authorities had set up a refugee camp for Christians in Syria (the center of Syriac Christian enclave in the province of Mardin) reserved for Syriac Christians, capable of hosting 4,000 refugees. ASIA/JORDAN- King Abdallah II: Christians are an “integral part of the tissue of the Arab world"